We partnered with Ivy to select seven savvy ivy Designers to answer all your holiday décor conundrums and find out how they get ready for the busiest season of the year. What immediately sayâ€‹sâ€‹ â€œholidayâ€ andâ€‹ transforms aâ€‹ room? A bit of shimmer, candles, and a cozy throw. Should one change around the rugs for holiday events? If yes, which rugs would you pick? What trends are you seeing for this holiday season? I am seeing more usage of greenery in creative ways throughout the home, and not just the expected tree and garland. I love the use of sprigs of pine or sage for gift wrapping, table accents, and even terrarium ornaments. I am seeing more unusual color combinations as well, so that you don’t have to stick to green and red exclusively. I love adding some deeper reds mixed with oranges, yellow, or rust to keep more traditional holiday décor fresh. Metallic accents are showing up more and more in copper, which is a really pretty option. When it comes to holiday décor, do you believe â€œmore is lessâ€ or â€œmore is always moreâ€? I am definitely not a fan of clutter, and tend to design spaces that are more carefully curated than filled with random decorations. That said, I do think that holiday décor is the one time when you can get away with laying it on a little thick. Just don’t go crazy. I would make sure that everything relates to the other in some way; put out everything that you love, and then stand back and edit, edit, edit. What immediately says â€œholidayâ€ and transforms a room? For me, the holidays connote warmth and drama. An easy way to achieve this is by arranging flowering (cherry, apple, and plum blossoms) or leafy branches (eucalyptus or olive) in tall vases for a spectacular yet simple focal point -â€” stress-free, affordable, and long-lasting. Go the extra mile: add white lights and place several vases at varying heights to create a magical effect. Â Add woven textures to warm up a space. Think baskets, throws, and pillows in festive sheens or fall colors. Bring in an extra table or floor lamp for ambient light during the darker months. Lamps casting interesting shadows like this one are a bonus! Add a large ceramic bowl of pomegranates or oranges studded with cloves in your foyer to welcome guests with color and scent. Nothing says â€œwelcomeâ€ like a brightly colored entry rug. If you have the space, a great vintage runner can lead guests into your home. If you have light-colored, fragile, or expensive rugs, I always recommend putting them away for the holidays. Even the most careful guests have been known to spill, but this would camouflage even the worst offenses. With the world in the current state it’s in, I think we will see a trend toward keeping it simple with a focus on quality over quantity. Rather than decorating the entire house, for example, the emphasis will be on setting a beautiful table, so guests can gather around and connect in meaningful ways. While I do enjoy a little decorative drama, I also think it’s important not to overdo it â€” in the end, it’s about friends and family, so if neither can fit comfortably in a decoration-packed home, it’s all for not. Decadent textures and rich tones such as faux fur throws and jewel-colored velvet pillows transform a room and say holiday to me. Add a fire and pine-scented candle, and done. Metallic pillows can do no wrong. A beautiful scent always says you’ve taken the time to create a glam atmosphere. Also, take an expected item like this ice bucket and fill it with flowers or a plant. Go big or go home with this stunning mirror. The MOST glam would be this antique telescope set to look outside a fantastic window (whether you’re looking up at the birds, the stars, or spying on your neighbors). Personally, I’m not a fan of trends in the home. I believe your home should reflect you, your experiences, what makes you unique and happy! For holiday décor, more is ALWAYS more â€” layering a home to the max is what the holidays are all about! Greenery for me evokes everything holiday: color, smell, tradition; all it takes is one happy sprig to transform a whole room. Being in Texas, I go for a big fat swag of readily available Juniper branches on the mantle, and often double up on the scent with a Genevrier candle from Diptyque. Blackman Cruz Brass Rose Tea Cart â€” This handsome bar cart with its amazing shape and leather details will up the ante for any holiday soiree. The mirrored shelves provide the perfect amount of gleam. Magni Home Collection Deneuve Mirror â€” Placing this stunning mirror up against a wall or in a dark corner will transform any space; the gold leaf and reflective glass will bounce the light around from your string lights and candles for a magical effect. Fritz and Floyd Mid-Century Glazed Candlestick Holders â€” Add these amazing Sphinx candlestick holders to your holiday table scape (with red candlesticks of course) for a seriously chic statement. Antique Marble Ware Jug â€” Stick a bundle of greens in this baby and call it a day; the gold and green tones will work with any holiday décor, and the marbling creates a perfect accent. Kravet Red Thabo Mohair Throw â€” I love this happy plaid as an alternative to red and green; tossed over the arm of a chair or sofa, it punctuates any room with cozy cheer. This rug makes me think of Christmas tree ornaments. I love the color variety! Red is the color of the season, and this cheery hue, tempered by the splash of violet, is so on point. A sucker for tradition, this crimson rug would make me oh so happy, and anchor the whole house in holiday spirit. Marbling â€” From wrapping paper to ornaments, marbled everything is huge this season. Velvet â€” Making the jump from Santa’s suit, velvet is a major component in holiday décor this year. Velvet ribbons on packages and wreaths in off-beat tones like lilac and powder blue, or swapping out the pillows on your sofa are good ways to adopt this trend. 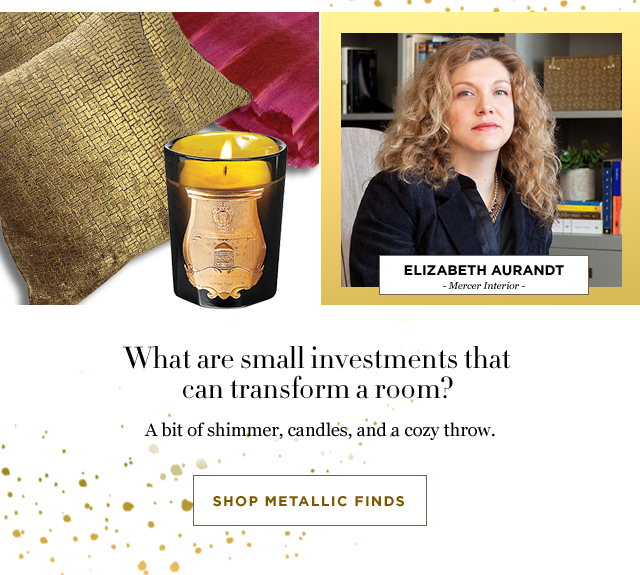 Alternatives to red and green â€” Softening the often wearisome barrage of red and green everything, I am seeing hues of grapefruit, russet, apricot, and citron cropping up in table settings, holiday décor, florals, and most fun of all, fashion. I love the holidays and I am a maximalist, so to me, more is always more â€” with conditions of course. There is nothing that irks me more than the superfluous stocking of retail shelves with cheap junk that ends up in landfills. So yes, go nuts (I do! ), but be tasteful about it. I opt for an abundance of natural décor, like greenery and bowls of citrus, holiday string lights, candles, and the pieces I pull out every year that get better, and cooler, with time. Flowers, greenery, tall branches in vessels; shiny, glittery gorgeous objects!… and a tricked-out bar cart! Oh, and music always sets the tone. While most people would not go to the effort of changing out a large area rug, think about layering a hide or sheepskin rug on top an existing carpet or rug, or adding smaller area rugs in spaces such as the entry, or a hallway. I love this sheepskin area rug, this uniqueÂ Â wool and silk rug, and this colorful wool rug. Color! And by that I mean not simply red and green…although these staples will always be around, try pops of orange or hot pink, accented with silver or brass. If you want to stick with green, go emerald! It certainly is a matter of personal style, and sometimes even the style of home you live in. I am a collector, so I tend to gravitate toward more is more! If you pick a color scheme, even keeping gift wrapping uniform, your space will look more tailored, less busy. Have fun, experiment, and do not be afraid to be over the top! Garland over the fireplace and a wood burning fire immediately say holiday to me. The smell of pine and ambience from the fire have a way of transforming a room. Yes, I think moving some rugs around is a good idea if you are entertaining, or if you need some extra warmth and color in areas such as hallways and entries. My favorites are this Mehraban Anatolian rug, this Glen Cove lambs wool cream rug, and this Turkish Oushak Rug. I’m seeing a lot of texture and material combinations, the repurposing of natural materials, giving products an organic and freeform feel. Tabletops made of earthenware, ceramic, or forged brass that have live edges, furniture upholstered in sherpa. Patterns found in tabletops or textiles are also embracing the organic-occurring forms and tones found in nature or process. Additionally, there is recent emergence of faux greenery that isn’t cheap or faux-looking. I actually can’t believe I’m saying this, because it generally isn’t my approach to design…but, when it comes to the holidays, more is always more. I love that you can get away with it during the holidays without it feeling like overkill. It can feel fun and festive. For any holiday, there is nothing like a delicious meal and an exquisitely set table to welcome guests and usher in the party season. Polish the silver, dust off your finest set of china, place winter blooms in all your vases (or even empty juice glasses) â€” layer all of your best dishes and glassware atop a crisply ironed tablecloth, and invite people over for a warm, easy dinner to set a celebratory tone for the coming months. There are so many ways in which to amp up the glam factor for the holidays, it’s hard to choose just five! An easy update is to swap out sofa pillows for something a little more richly colored and luscious. These pillows would be beautiful on a sofa of any ground color. It’s also fun to set up a bar cart for holiday parties, stocked with lots of glasses, mixers, and maybe a pitcher of your favorite winter libation. Since the fireplace (at least in California!) gets very little attention at least nine months out of the year, it’s a welcome change to make it a focal point during the winter season. These beautiful andirons would elevate a fire in any setting. Mirrors always up the â€œglamâ€ factor, but during the holidays, they do even more work in our homes, reflecting candlelight, tree lights, and glittering ornaments and decorations. I would use this one all year long. And speaking of candlelight, I covet these rock crystal candlesticks, which would be so gorgeous atop a dining table during a holiday party, or grouped together on an entry console to announce to your guests that they’re walking into a beautiful, warm, and welcoming environment. I love the tradition of changing rugs and slipcovers with the season. In the summer, a simple sisal carpet and white cotton slipcovers feel fresh and appropriate. In the winter, why not go for a bolder rug on the floors with velvet slipcovers or pillows? I love the richness and vibrancy of the colors in these carpets, which bring the added advantage of camouflaging the wear-and-tear of lots of holiday visitors and the occasional spills of wine and food, and which are cozy besides. This holiday season, I’m expecting a trend toward unexpected colors for decoration. Instead of the usual Crayola reds, greens, and blues, people will be decorating with softer colors, for example: mauve, sage green, cerulean, and even â€œmillennial pinkâ€. I would advise clients â€” instead of resorting to traditional holiday colors â€” to embrace the colors they love the most, and simply amplify those same colors in their decoration. Love orange and turquoise? Just go a little bigger with that, and don’t feel compelled to introduce red and green into the mix. More is ALWAYS more! The holiday season is a wonderful time for us to contemplate all of our blessings and to recount the things for which we should be most grateful â€” family, friends, and health. Decorating for the holidays should manifest our appreciation of this abundance. The biggest gift that we can give to others is our time and attention. When we decorate our homes for the holidays, we are communicating to those closest to us that we appreciate their presence in our lives and took the time to make special preparations for their visits, and to make those visits memorable. What better season of the year to embrace MORE? Ivy is the fastest growing community and business management tool built for interior designers, by interior designers. Click here to join now and get $99 off annual and 3-year Ivy memberships for your first year. Shop all of the Ivy designer picks on Viyet!